Like a Fine Wine: Pascal Dupuis. The Marian Hossa Trade will go down in Pittsburgh Penguins lore as one of the most influential moves ever made by a Penguin front office, in the best way possible. we received that lovable undrafted journeyman right winger that had been averaging somewhere around 9 or so goals a season. That's right, we received Pascal Dupuis. 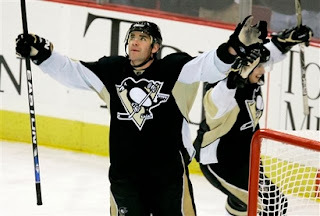 Before arriving in Pittsburgh, Pascal Dupuis had played for 3 NHL teams. The Minnesota Wild, The New York Rangers, and the Atlanta Thrashers. putting up respectable numbers most of the way, including an impressive 2002-2003 outing with the Wild where he netted 20 goals and dished out 28 assists. He had always been a speedy workhorse that could get the puck up ice in a flash, and take abuse in the corners to set up the big shots. These attributes have their allure to NHL teams for sure, but more than likely will make you a trade afterthought rather than deadline centerpiece. It was not his numbers that made Dupuis a trade win, it was much, much more than that. It was the fact that he fit in perfectly with what the Penguins were trying to accomplish. Pascal Dupuis found more than another shot at a few years of NHL paychecks when he found his way to the Pittsburgh Penguins. Much more than that, Dupuis found a home. He found a rabid, exploding fan base that was eager to see success. He found what may be the best ownership team in modern sports, and an organization that more than any he had ever been a part of just better "Understood" how to connect with its fans. Not to mention a couple of young phenoms named Sidney Crosby and Evgeni Malkin. Like a fine wine, Pascal Dupuis' numbers have gotten better with age. something commonly heard milling around during game time in our fair cities drinking establishments. People often comment on the fact that Dupuis numbers have gradually increased over the years (he is 34). However if you look at the numbers, it has been less of a gradual increase and more of a violent explosion. Furthermore it has less to do with an uncanny Benjamin Button aging effect, and more to do with the fact that he has found a spot on a line with which he is more comfortable and more confident than he ever has been before. From his call-up in Minnesota during the 2000-01 NHL season, through his last stint with the Wild in 2006-07 and including one year lost to an NHL Lockout (so 6 seasons of varying amounts of games played) Pascal Dupuis played a total of 334 regular season games during which he scored 67 goals, and contributed on 74 assists for a total of 141 points. Duper's time in New York with the Rangers is hardly worth noting, but for the sake of completeness, he played six games and had a goal in there somewhere. That brings us to a total of 419 games, 81 goals, and 81 assists for 162 points over 6 years. Since the Hossa trade brought Pascal Dupuis to the Penguins, he has played 392 games over 5 complete seasons, and including the short time following the trade, and the 13 games played so far in 2013-14. This means that through 27 less games than he played during his entire career before arriving in Pittsburgh, Pascal Dupuis has scored 15 more goals, assisted on 45 more goal scoring efforts, and scored a total of 60 more points over a smaller margin of games. Its clear to me and should be to everyone that Pascal has found a rhythm here with the Penguins, and the level of talent he is playing with is unlike anything he has ever been associated with before. Above everything Dupuis is an invaluable part of the chemistry of the team, and provides the type of cliched "Veteran Leadership" that so many talk about as being an incredibly important asset to any team full of young up-and-comers. It's funny how hindsight can be twenty-twenty. Looking back on the day the Trade for Hossa was made I can remember plenty of Penguins fans who thought it was a dumb move. One of those late season acquisitions that make some pump their fists in delight and some shake their heads in remorse of what might have been lost. When all is said and done, the Penguins not only picked up a future first line winger, mentor, and producer, but also came away with what many think of as a key component to the heart and soul of a beloved franchise. The heart and soul that could have gotten a bigger paycheck in another town this year, but stuck around for less money. He says it's because he and his wife Carole-Lyne know the area and can always find a babysitter for his four children. That's all well and fine, But I don't think it's much of a reach to say that I feel as though being able to skate alongside the greatest hockey player in the world might have had something to do with it.